On Monday I—humbly—joined a group of NYC's most sophisticated thinkers on all things data for a half-day unconference to help O'Reily organize their upcoming Strata conference. The break out sessions were fantastic, and the number of people in each allowed for outstanding, expert driven, discussions. One of the best sessions I attended focused on issues related to teaching data science, which inevitably led to a discussion on the skills needed to be a fully competent data scientist. As I have said before, I think the term "data science" is a bit of a misnomer, but I was very hopeful after this discussion; mostly because of the utter lack of agreement on what a curriculum on this subject would look like. 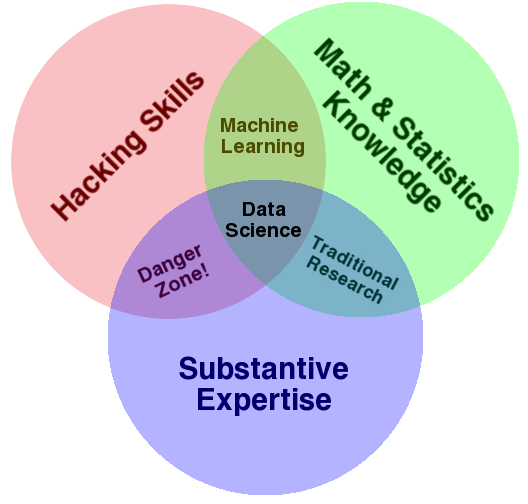 The difficulty in defining these skills is that the split between substance and methodology is ambiguous, and as such it is unclear how to distinguish among hackers, statisticians, subject matter experts, their overlaps and where data science fits. On Monday we spent a lot of time talking about "where" a course on data science might exist at a university. The conversation was largely rhetorical, as everyone was well aware of the inherent interdisciplinary nature of the these skills; but then, why have I highlighted these three? First, none is discipline specific, but more importantly, each of these skills are on their own very valuable, but when combined with only one other are at best simply not data science, or at worst downright dangerous. Finally, a word on the hacking skills plus substantive expertise danger zone. This is where I place people who, "know enough to be dangerous," and is the most problematic area of the diagram. In this area people who are perfectly capable of extracting and structuring data, likely related to a field they know quite a bit about, and probably even know enough R to run a linear regression and report the coefficients; but they lack any understanding of what those coefficients mean. It is from this part of the diagram that the phrase "lies, damned lies, and statistics" emanates, because either through ignorance or malice this overlap of skills gives people the ability to create what appears to be a legitimate analysis without any understanding of how they got there or what they have created. Fortunately, it requires near willful ignorance to acquire hacking skills and substantive expertise without also learning some math and statistics along the way. As such, the danger zone is sparsely populated, however, it does not take many to produce a lot of damage.